These recipes can each be made in about ten minutes (or thereabouts depending on your speed). They use fresh summer produce, and take the usual heat of summer in mind. Cold soups, substantial salads, light meals, and no-cook ideas are all here with plenty of bright ripe tomatoes, cooling cucumbers, and prolific zucchini in the mix. Have blender, will eat dinner. For each serving, whirl an avocado, a small clove of garlic, 1 tablespoon lime juice, and enough chicken broth to make it as soupy as you like. Add salt to taste. Chill before serving on the hottest of days and garnish with the fresh herbs of your choice. Tortillas, tortilla chips, or crusty bread make a light but quick meal. On the hottest of days a raw and refreshing Caprese Salad—an arrangement of ripe tomato slices, fresh mozzarella, and basil drizzled with olive oil and sprinkled with sea salt—can seriously fit the bill. Make big portions, add some bread, and dinner is done. 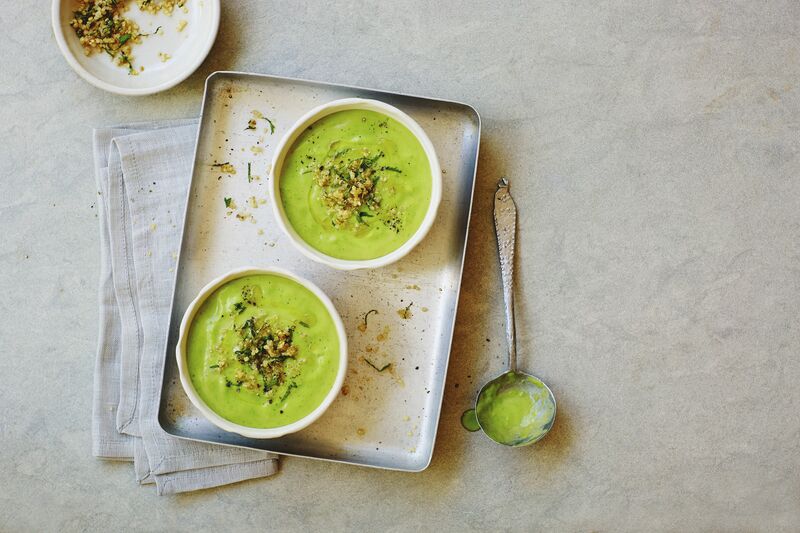 Cold soups are perfect for beating the heat. Many cold soups require cooking and cooling – perfect for making in the cool of the morning enjoying at dinnertime, but not a 10-minute-total situation. Not this creamy smooth soup. Chop a large cucumber, in a food processor whirl it with about 1 cup of plain yogurt and 1 green onion, salt to taste, and serve garnished with dill. It's seriously that simple. This crunchy and flavorful salad featuring raw (yes, raw!) corn is lovely served on a bed of lettuce or arugula for a light summer supper. Okay, you'd have to be amazingly speedy in the kitchen to get this Fattoush Salad pulled together in ten minutes, but it is possible. The prep time for this salad all depends on your chopping skills. A second pair of hands to chop or mix the dressing will make ultra-quick work of this satisfying yet cooling salad. The toasted pita chips and feta cheese give it enough substance for a light meal. Grilling concentrates the oceanic flavor in each pair of mussel shells. Plus, it's quick and doesn't heat up your kitchen. Pan-roasted and even steamed mussels are also speedy, light dinners. It's true, you don't cook this tomato sauce at all: While you bring a pot of salted water to a boil and cook about 1 pound of angel hair pasta, chop up 4 to 6 medium tomatoes and put them in a bowl large enough to toss the pasta. Pour in about 3 tablespoons olive oil and stir in a minced clove of garlic. Add the hot drained pasta, toss to combine, throw in a handful of chopped basil, salt to taste, and serve. This traditional tapas dish, pan con tomat or "bread with tomato," from Spain makes the most of few ingredients. Who knew a bit of bread, garlic, olive oil, and tomato could be so crazy delicious? Cut a clove of garlic in half and rub the cut-side on a piece of halved baguette. Cut a tomato in half and rub it onto the bread, letting it really sink in there. Voila—a few raw veggies to nibble on the side, a bit of cheese, or some slices of prosciutto or other cured meat, and your no-cook dinner is done. Quick and delicious, a plate of salad rolls with some crusty bread or even a few crackers make a casual summer dinner. Toss arugula with a lemon vinaigrette and wrap it up, about a handful at a time, in prosciutto. Use toothpicks to hold together, if you like. Zucchini blossoms are amazingly tender and lovely. If you work quickly and start heating the pan before you chop the blossoms, you can definitely get this omelet on a plate in 10 minutes. Heat an omelet pan, chop the zucchini blossoms, melt about 1 tablespoon butter in the pan, and cook the zucchini blossoms until wilted and tender. Transfer them to a plate. Whisk 2 or 3 eggs with 1 tablespoon or water, milk, or cream. Add more butter to the pan, add the egg mixture, when the eggs are almost set, add the zucchini blossoms and some cheese, fold the omelet over, remove from the heat and let sit a minute or so to melt the cheese. Use this raw zucchini pesto on pasta that you cooked while you make the pesto or simply slather it on thick slices of lightly toasted bread for a simple, seasonal, tasty meal. In a food processor, whirl a chopped medium zucchini, a clove of garlic, 2 tablespoons pine nuts or pistachios, 1/3 cup grated Parmesan cheese, a handful of basil leaves, and 3 tablespoons olive oil. Add salt to taste. Perfect Spiced Cherries for Cocktails or Preserving!